'Hollywood And Vine' (James McWhirter, R. 1991). Seedling# J85-30-2. TB, 36" (91 cm), Midseason bloom. 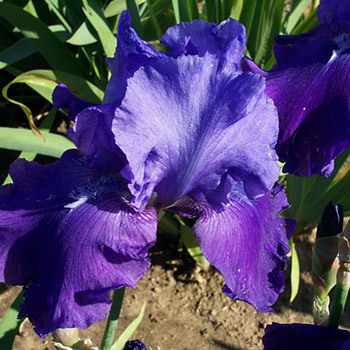 Standards light magenta grape; falls darker magenta grape; beards blue violet; ruffled; slight fragrance. 'Ensemble' X 'Noble House'. Cottage 1992. From AIS Bulletin #284 January 1992 Introducing HOLLYWOOD AND VINE (James!McWhirter, 1992). TB, 36", M. Light magenta grape standards with falls having slightly darker shades. The blue violet beards add excitement. Nicely ruffled flowers. Sdlg. J85-30-2: Ensemble X Noble House. $35.00. Cottage Gardens. JPG HollywoodandVineSI.JPG manage 208 K 16 Apr 2019 - 15:52 Main.TLaurin Photo by Sandy Ives.